Discover Scuba Diving IN OAHU WITH Big Kahuna Water Sports! Introductory scuba dives for first time divers, no certification required. Swim with turtles and fish and discover a world under the waves! Have you ever wanted to experience scuba diving? Well, you're in the right place! We have been taking first time divers scuba diving in Hawaii for nearly twenty years. With our perfect safety record, emphasis on fun and our joy in helping others discover the thrill of Oahu scuba diving for the first time, we know you'll love discovering scuba diving with us! Join us for the best in Waikiki Oahu scuba diving and snorkeling with plenty of turtles and fish! Our goal is to provide you with a safe, fun and relaxing ocean adventure in Hawaii! Go Beyond Snorkeling—No Experience Necessary! Two shallow Hawaii reef dives from our scuba friendly boat. Only $149! You don't have to be a certified diver to try scuba diving for the first time. Come and swim with the turtles and fish in Waikiki today! Our Discover Hawaii scuba diving experience is a half-day charter with two shallow (max 35 feet) introductory boat dives at two different reef sites. No classroom tests or studying is required. All you need to know we will show you on the boat before you enter the water. In addition, all the rental gear you need is included in the $149 price! Discover Scuba Diving in Oahu is designed to allow anyone to experience scuba diving for the very first time. In the warm clear ocean off Waikiki Honolulu, under the direct supervision of the Big Kahuna, a PADI certified Instructor, you'll get to experience the thrill of easily breathing underwater! Two new divers discover the joy of scuba! First, reserve your spot today as space is limited on our boats! Second, prepare for fun! Bring a towel, sunscreen, swimsuit and snacks/water. Everything else you will need is already on the boat. The boat leaves the dock promptly at 9am. On the 20 min ride out to the dives sites, you will be briefed on what to expect and the few simple skills you'll need to know to dive safely, such as mask clearing, how to equalize your ears to the water pressure, regulator usage, clearing and recovery, proper fin kicking and basic hand signals. Once we arrive at the dive site, the boat is moored in place. A wide platform on the side of the boat is then lowered to provide an easy way on and off the boat. Guidelines descend for twenty feet below the platform, providing you something to hang on to while the Instructor takes each person through the basic skills before descending all the way to the reef below. With only four divers per instructor ratio, you're assured of safety and personalized attention. Our Big Kahuna has been teaching and leading Oahu scuba divers for 17 years! He still loves watching the faces of young and old light up at their first experience of the amazing world beneath the waves. Our Discover Oahu scuba diving experience encourages scuba diving exploration for first timers and beginners new to the ocean to satisfy their curiosity about Waikiki scuba diving in a way that is supremely safe and enjoyable. 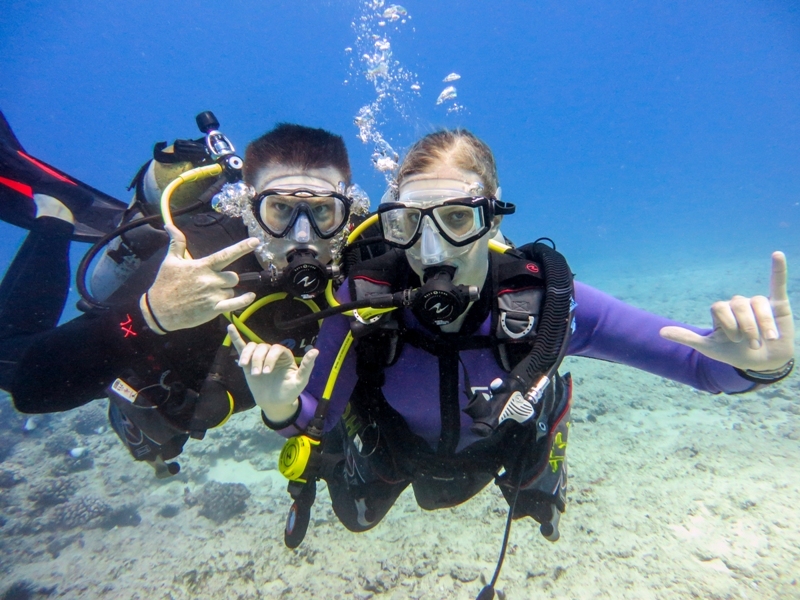 Click here to get your PADI Scuba Certification in Waikiki Honolulu Hawaii! Ready to Get Scuba Certified? Get certified in three days for only $425! This is the best scuba certification deal on Oahu! PLUS, you get two extra dives for free! Big Kahuna Water Sports is the only island dive operation on Oahu offering six dives with your PADI scuba certification. Add personalized instruction, a perfect safety record, turtles galore and a budget price of only $425...how can you resist? Get scuba certified on your Waikiki vacation with the Big Kahuna!